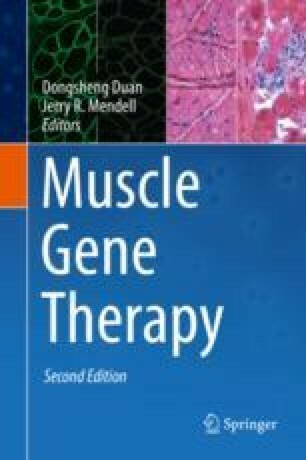 As the most abundant tissue in the body, skeletal muscle is a challenging target for the would-be gene therapist, particularly in the context of a severe disease such as Duchenne muscular dystrophy (DMD), where the bulk of tissue is simultaneously being destroyed and regenerated. Such instability poses the problem of maintaining any potential therapeutic expression construct or genetically corrected nuclear information but offers the compensation of the prospect of using the repair mechanism itself as a vector for genetic material. The best-attested myogenic stem cell is the skeletal muscle satellite cell, a Pax7+ve cell, sandwiched between the muscle fibre plasmalemma and the overlying basement membrane. However other cell types capable of myogenesis have been identified, lying outside the muscle basement membrane and, in the dormant state, not expressing Pax7; their place in muscle development and maintenance has yet to be definitively established. Two major unresolved problems for the strategy of direct intramuscular transplantation of muscle precursor cells are the massive necrotic loss of such cells when grafted into muscle and their poor migration within the recipient muscles. The main alternative approach involves grafting cells derived from pericytes or CD133-expressing cells isolated from muscle, which are shown to be distributable via the blood to widespread muscles where they extravasate, adopt a myogenic phenotype and repair diseased and damaged muscle fibres. This approach is subject to the problems that the cells are incompletely characterized, and their property of being distributable via the vasculature has not been widely reproduced.